Much as I love San Francisco, I love Monterey even more. Monterey is where I lived for 2 years during grad school. I hadn't been back since the summer after graduation so I was very excited for our trip. I couldn't wait to show SP around and to see what had stayed the same/changed. We arrived late afternoon on a Sunday and took a walk to my old apartment, my grad school, and down Alvarado Street. 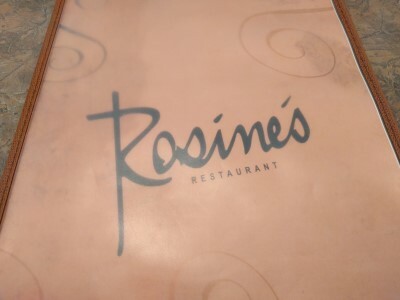 We hadn't eaten much so we decided to have an early dinner at a restaurant that was there when I lived there and that I ate at many times: Rosine's Restaurant. Rosine's is just as I remember it. The incredible, huge desserts are still on display in a glass case when you walk in. The large windows along Alvarado still open when it's nice. Other than an albacore tuna salad sandwich, I don't remember what I used to eat when I dined there 20 years ago. 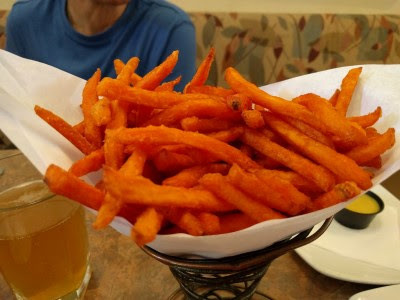 This time we started with an order of Sweet Potato Fries, which were delicious. 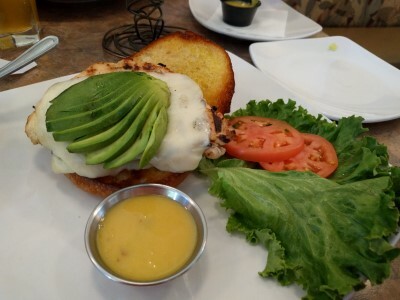 I decided on the California Chicken Sandwich (charbroiled chicken breast topped with melted Monterey Jack cheese, sliced avocado, almond honey mustard sauce, served on a buttered, toasted sesame seed bun). It was really good. A very nice charred flavor on the chicken, lots of creamy avocado, the mustard sauce had a nice bite. For my side, I had a house salad, but the photo was too blurry to post. 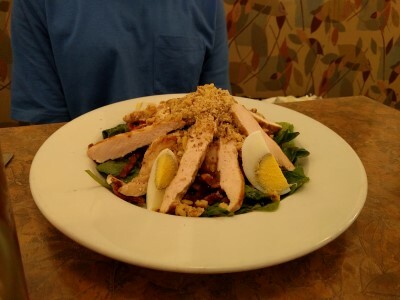 I thought SP chose a chicken salad, Honey Crisp Chicken Salad (fresh greens with cucumbers, corn, diced tomatoes, sliced almonds and chicken tossed with homemade honey mustard dressing) but based on the photo and the menu descriptions, it looks more like Cobb Salad (garden fresh greens topped generously with fresh turkey, avocado, bacon, blue cheese, tomato, eggs and black olives, served with your choice of our homemade salad dressing). He would have asked for no blue cheese. Whichever salad it was, it was a generous size and he said it was very good. We both enjoyed our food. Our server was very friendly and kept our iced teas/waters filled. It's the same casual, homey, tasty place I remember. We'd go back on our next trip. Hopefully next time, we'll have enough space in our bellies for dessert.